Apple's free iDisk app has potential to make that $60 a year for MobileMe even more worthwhile, but for now it's little more than a fancy file viewer with mediocre management capabilities. With the iDisk app, you can view supported files like documents, PDFs, even stream music and movies (provided they're in the right formats, natch) and remotely delete stuff from your iDisk. An annoying quirk, though, is that you have to dive into every folder individually to get it to refresh and show any new files. Document and PDF viewing work perfectly. With music and movies, the better the connection, the better the streaming experience, though don't expect to stream your whole iTunes library over it—it's a one song at a time kind of deal. And the movie file support is finicky, to say the least. But when it works, it's pretty nice. The strong point of the iPhone app as a manager is that it makes it incredibly easy to share files—go to the file you want to share, click the little wireless icon, and you can email a link to it with an expiration date you set. 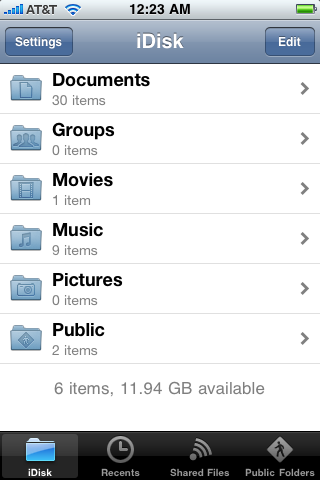 It also has a bookmark list of your friends' public folders, you can quickly get back to them. Bottom line, Air Sharing has nothing to worry about. Besides requiring a MobileMe account, you can't upload files to your iDisk from the iPhone, or store any of them locally, which is what really gimps the app. I'd hope that Apple would expand its capabilities, but my suspicion is that they don't actually want you to store files on your iPhone or browse through them like you would on a regular computer—it's a conceptual line they don't want to cross, so we've got a viewer with great interface here, nothing more.